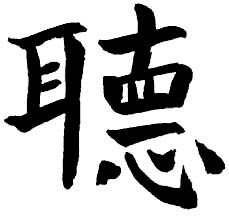 And here is the Chinese character for listening: on the left, the sign for ears, while on the right, from top to bottom, the signs for eyes, full attention, and heart. What a beautiful visual metaphor for the engagement of listening. And that is what I have been doing, my imaginary friend, listening to the sounds of the world and pondering the ineffable beauties of poetry. Yes, wouldn’t this be nice? A convenient spray pump to ease the tangles …thank you, Laz.